UCOG Today [Paul Kieffer] » Blog Archive » Too good to pass up? This week’s Walmart Acer Netbook offer might be too good to pass up. Nearly three years ago I bought an Acer netbook with an 8 inch screen and 1024 x 600 pixel screen resolution. With a couple of tricks I was able to install all the software I use for work, and other than occasionally having to wait a bit for a program to load up, the Acer 150 has worked fine. A number of my friends would not be bothered with such a small notebook, but for me it turned out to be ideal. I travel a lot on the train in Germany, and when I fly back and forth across the Atlantic, it is nice to sit in my customary economy section and be able to open the netbook without worrying about the guy in front of me breaking my screen if he should happen to recline his seat unexpectedly – for me! (That actually happened to a friend on a flight.) 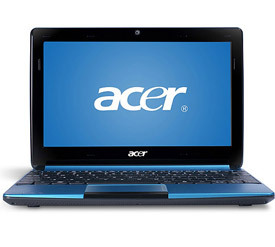 This week Walmart has an offer for a later Acer netbook model, the D257. It has a 10 inch screen, a 250 GB internal disk and Windows 7 starter as the operating system. The price is only $228, which is hard to believe. If this successor model would provide the same service as the one I currently have, it would be an offer that would be hard to pass up!